I've been working for a little while now on these scrappy centred star blocks. 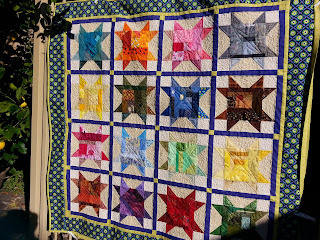 They are fun to create, make a bit of a dent in the scrap stash, but I think I'll have to make several more before my box of scraps (plus the other small containers, zip lock bags etc) decrease substantially. 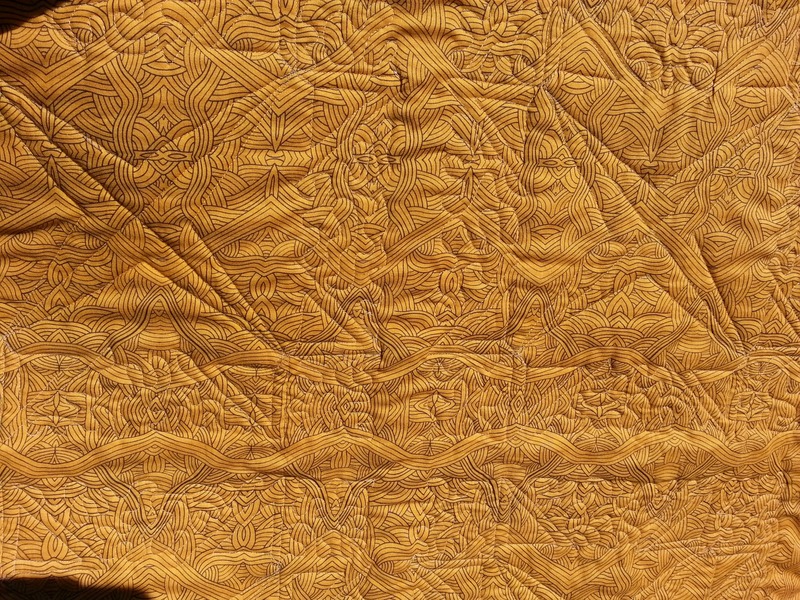 They are 10inch finished blocks so adding the sashings and borders it's a 55inch square - a lap quilt size. I like the fact that some of my novelty fabrics have a chance to appear there, so a sheep and some spiders! 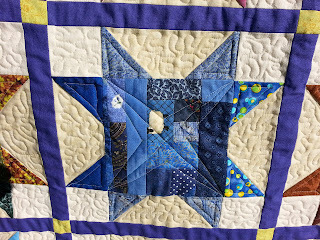 When it came to quilting I thought I'd give the star pattern a try - a simple corner to corner in the centre of the block first of all, then heading to a dot I marked with fading pen, just one inch from the centre which creates that slightly diagonal line around the centre star. It's a bit clearer on the blue star so you get the idea. 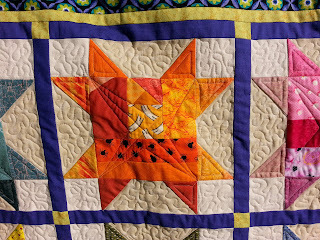 The backing is a great pattern that picks up the quilting really well, so the recipient can always just turn the quilt over when they get tired of the stars. 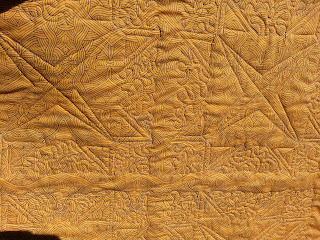 This makes one less on the original list of a dozen I created in May this year, so I'm down to 8 to go now. 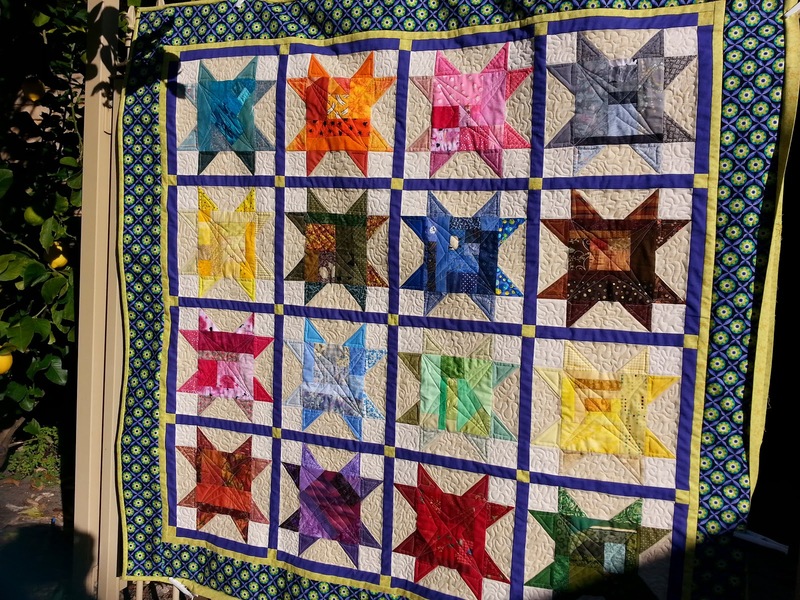 Two are flimsies, one I've begun quilting and 4 are 'in progress' and the eighth one is still 2 charm packs and additional fabric with the idea brewing in my mind. I know I'll get to it eventually and that's incentive to keep going on these UFOs. I'm linking up with Quilt Story; Freshly Pieced and Confessions of a Fabric Addict. Thanks Mary, hope the ankle heals soon and you rest up and hand sew meanwhile! Beautifully done! Congrats on the finish.